Content is king and we want to make sure it's easy to manage. With Warhead's simple, yet robust and intuitive Dashboard, you have easy access to any and all of your website's content. All in one place as it should be. Not only is content easy to manage, but Warhead also allows for a vast range of content mediums to easily be added and managed right in the dashboard. Everything from simple page text to custom blogs and galleries. You have content, Warhead can manage it. Quickly and easily create new pages for your website with the simple click of a button. There are no limitations on the amount of pages within a Warhead site, so feel free to create away. Your content can be vast and all over the spectrum. The Warhead dashboard helps you easily organize content based on its type. Keep your blog posts all within the organized Blog section. Need to rearrange the order that your pages display in a menu? Simply drag and drop to reorganize them. Organization is just another feature that makes your content easy to manage. When creating and editing content in the Warhead dashboard, your content updates in real-time across all of the platforms your site is designed for. Simply update the content, save it and you're done. Forms are a great way to quickly collect customer information from your website. With Warhead's simple and intuitive form builder, you can easily create contact forms, newsletter sign ups and nearly any other type of form you can imagine. With Warhead's built in dashboard analytics you get to see all your website data organized in one place. View page visits, bounce rate, average duration, etc., right there when you first log into your dashboard. If you have a store attached to your site, you can even see things like sales, revenue, tax costs and much more. We know running a site that needs to be updated regularly can be extremely time consuming. 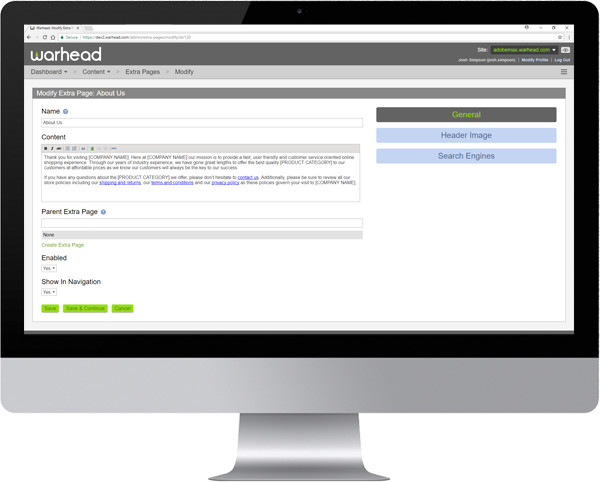 Warhead allows you to quickly and easily add users to your website. You can even control what sections users have access to. Maybe you have a blogger and want them to only have access to the blog section while another manages the store. With Warhead it's easy to add more users and manage their permissions. You put a lot of time and effort into your site and content. We want to make sure it's secure no matter what. Warhead stays up to date and beyond on site security so you never have to worry. No more searching and digging for the best hosting options for your website. All Warhead sites are hosted in the cloud on Amazon's web servers to ensure optimal loading speed and uptime. With Warhead's patented drag and drop CSS grid system you can visually create custom layouts in the blink of an eye. No more fumbling around with code or predetermined grid templates. 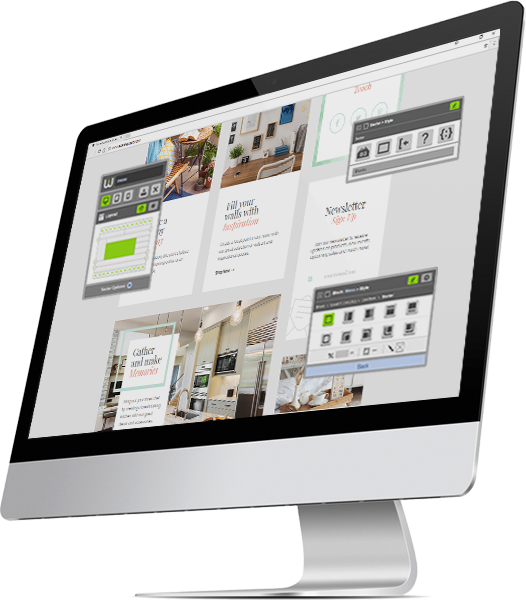 Warhead gives you full control to easily create and manage completely custom layouts. Ultimately, we design websites for the user to have the best experience possible. So why not design from their viewpoint? Warhead lets you do exactly that: design sites in real-time, in the browser, from the users' standpoint. Not only do you get to see how your site looks visually, you will see how it functions as well. Warhead's built-in block system lets you instantly add features such as galleries, menus, lists, carousels, content and much more all with the click of a button. No need to hand code content containers, Warhead does that for you. Styling entire rows or sectors of content has never been easier. The intuitive second panel lets you add styles to every block and the content contained in each sector to quickly style an entire page effortlessly. In the theme builder's intuitive third panel you can quickly and precisely control all the CSS styling aspects for any block, sector, row or element. All visually without any code knowledge. The best part? You visually see all your CSS changes happen in real-time. Every website has elements that need to be included throughout the site, on every page. With the custom, page, and global style settings you can easily set entire pages and even individual blocks to custom, preventing the styles from affecting the rest of the site. Warhead uses adaptive web design for mobile and tablet design creation. This allows for a truly immersive and fully optimized user experience within each environment. Your styles and content are easily pulled from your desktop design allowing you to add, edit and remove any elements and styles that are unneeded in mobile and tablet environments. Unlike most visual web builders, Warhead doesn't limit engineers, developers and any with code knowledge from adding even more custom functionality. Warhead takes care of the essentials allowing your developers to focus on the more complex features you may need. There truly are no limitations to what you can do with Warhead. We are always updating and tweaking our sites after initial completion. Warhead allows you to easily create from new or copy existing themes you have already designed for your site. Now you can test any new design and layout changes before publishing the site for visitors to experience. With the built in Warhead Ecommerce platform you can easily and seemlessly add products to any warhead site turning a simple website into a fully functioning ecommerce store. Quickly and easily adjust pricing, sales, category structure etc. all in the store dashboard. Mobile shopping is integral in a successful online store. Our robust desktop store functionality easily transfers down to mobile and tablet levels allowing customers to shop on the go easily and quickly. Warhead features multiple payment and shipping options built right in. Easily group items into different shipping groups and payment groups if needed. Provide your customers with many options for shipping and payments all built right into Warhead. Once your store is up and running and orders start to flow in, Warhead allows you to easily manage and process all orders as they are placed in real time. Everybody loves discounts and sales. Now you can love offering them with Warheads simple yet robust dicount system. Easily set up discounts sitewide or down to individual products. From promo codes and percent mark downs all the way to Free Shipping, you will be able to easily add any discount you need. Warhead allows for easy to use tax controls that allow you to add taxes on a general scale all the way down to zip code based tax percentages. With the ability to easily import entire csv spreadsheets of products, customers, and even variants you can not only easily manage a large store but also easily move an existing store over to Warhead in a matter of clicks. Seemlessly integrate with most major shipping providers to provide real time, accurate, address based shipping costs for your customers. We wanted the checkout process for customers to be easy to use and as quick as possible. 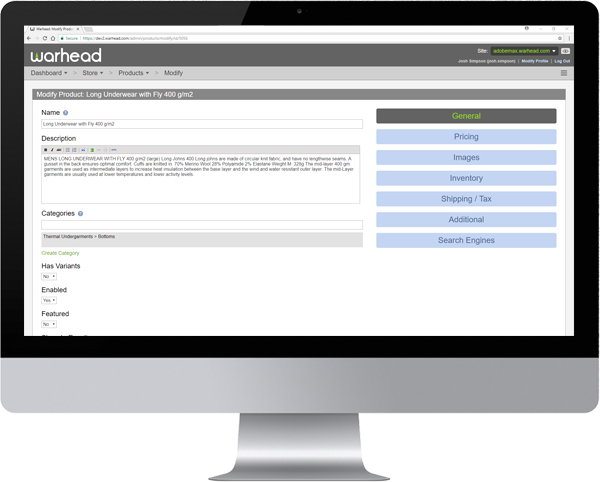 With Warhead your customers enjoy and easy to use one page checkout that is quick to complete. Repeat customers are always necessary in keeping your online store going. Easily manage customer accounts, access contact info, and even add notes updating them of order statuses or keep the notes internal for your own use with specialty clients. SEO. SEO. SEO. With online stores SEO is a make or break, fortunately Warhead has been built and designed around providing the optimal SEO for all Warhead sites and especially your Warhead store.